BOSTON—Upon returning to the dugout following a two-run homerun Sunday, Red Sox Nos. 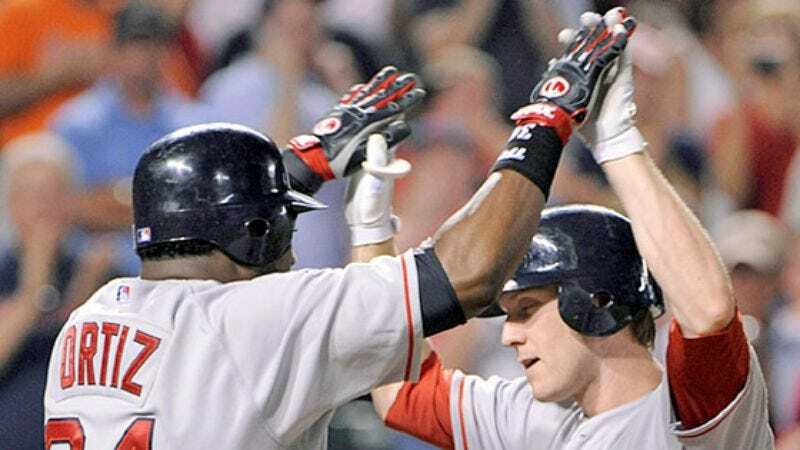 3 and 5 hitters David Ortiz and Jason Bay were unable to finalize the choreography of what will eventually become their signature congratulatory handshake. "No. You always point up to Jesus last," said Ortiz, Boston's leading slugger and head choreographer. "I like you, Jason. You're funny. But, come on, it goes slap, slap, bash, nod, hug, spin, slap, pose, cross arms, point. Not slap, slap, bash, nod, hug, spin, point, slap, cross arms, pose. I don't know why we would ever do that." In addition to their handshake woes, Ortiz and Bay have announced a delay in creating a dual nickname for themselves after Kevin Youkilis told them that "Jason Ortiz" was stupid and would never catch on.